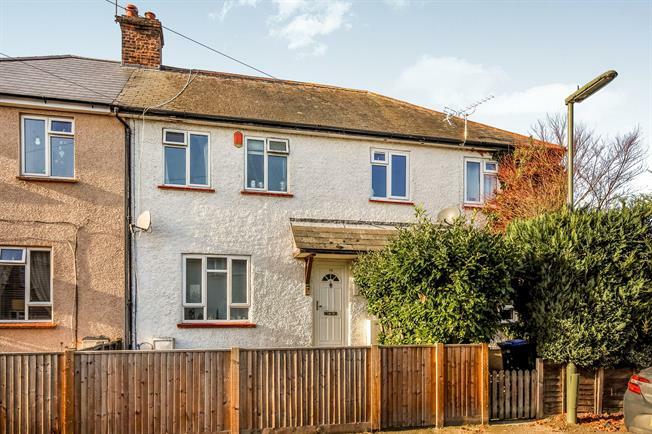 3 Bedroom Terraced House For Sale in Woking for Offers in excess of £300,000. This spacious three bedroom hall-entrance home offers ample accommodation across two double bedrooms, complemented by a third junior room into which a double bed would comfortably fit. Each room leads off a wide upstairs landing and each share a bright family bathroom. The living room is larger than normal with under-stairs storage, and the attractive kitchen is crisp and contemporary, is carefully laid out and boasts a breakfast area with attractive views over the rear aspect. Outside a raised decking area lends itself to al fresco entertaining, and the private rear garden is laid to lawn and contains a wide garage accessed from the rear, with the space to park a second vehicle alongside. Offered to the market chain free, this is an opportunity to acquire a spacious home at a great price.